This entry was posted in Events, Visionary Leadership and tagged Dakota Access Pipeline, Last Real Indians, Leonard Peltier, LRInspire, Standing Rock by lrinspire. Bookmark the permalink. Wow. I hope Obama does what you ask. Stand strong, your words are powerful. You are a very wise man. Dear Leonard. Your message reached my heart and tears spring to my eyes. Yes…we are rising and are granted to live to wittness the rebirth of humanity!!! One thing my heart longs to share with you. Jesus was not a Christian, while in the body he was as indigenous as can be, born in the craddle of the Essene people. I say because I understand that the New Jerusalem, the promised land, the New Earth, Shambala, the Good ways of the indigenous peoples….it is all the same. I live in ‘the old world’, waking up in a sleeping nation, where the white brother has forgotten who he is and where he comes from. But our world is collapsing, and more and more of us wake up in the realisation that our world is not the earth; that our culture was one of the first to be destroyed. we are finding our way back to our roots, our connection with grandmother earth and her waters. we stand up with standing rock and find our place to hold. our ancestors have been waiting long, as standing rocks traveling with the earth through the ages. waiting to welcome us back home. I know this is just the beginning and we have a path to travel…but we will! I pray for the day that weapons and misusing oil will be banned to the history books. I don’t know if we will live in the body to see the day, but we do see the dawn of this new day, where the old life, in connection with Creator and Sacred will receive the Peace that descends upon us. I honour you, and thank you for the immense contribution your life is to the awakening of humanity. I bow for you. I may only share 1% native American blood but my heart is with your cause. I believe this land should be shared any only people should benefit and not corporations. Thank you for this statement, a great chronological timeline of historical evidence. You kept notes during your improsonment, or gathered from your mind, a clear hope for Indigenous people, peaceful, representing their loving work as earth,water, and air, and peaceful heart protectors. With the tribes of the earth uniting, those who care for the environment have had the finest educators at Standing Rock North Dakota. I hope you are released to see dances and pow wows again, the decorative ti pis, and Mesa Verde. I hope you are asked to be ambassador and travel the world, and reinvigorate nature. My dear Leonard Peltier, how I can imagine you must have suffered! Now indeed the time has come to make a stand and a big change… I wish for you that the time now has come to sit in peace and enjoy the fruits of your work! Bless you, dear brother in this time of great upheaval. I want to sign the petition to free you at last, but I can’t find out how. The great people at Standing Rock are standing for more than just one place, but for all peoples everywhere on Turtle Island who feel as they do about the black snakes all over this land. Your advice seems so good to me. Thank you for warning the young people with such wise words. I hope they heed them. I hope they do not engage in violence as then these others will find reason to wipe them out. I love this land. I love the people. I send love to you. My older brother. I hear your words and encourage you to keep your view strong. You are not going unnoticed. The Sweatlodge, drumming and preys are strong for you. UNDRIP will be learned and school among our youth and elders. I love you for your looking out for our mother earth. peace with you. Leonard Peltier we at #DemocracyWatchNews (@dwatchnews @dwmnews_na) discussed your plea for clemency during a recent press briefing. You have our Support, Solidarity, and Coverage! Your struggle is now and forever legendary, for your Indigenous Nations’ and All who aspire to Social Justice and Human Rights globally! Your message Solidarity to Water Protectors at #StandingRock to #Detroit, #Flint and the #Resistance is of #BloodOaths and #Unity! ¡My Highest Regards Brother Leonard Peltier! Leonard Peltier we at #DemocracyWatchNews (@dwatchnews @dwmnews_na) discussed your plea for clemency during a recent press briefing. You have our #Support, #Solidarity, and Coverage! Your struggle is now and forever legendary, for your #Indigenous Nations’ and All who aspire to #SocialJustice and #HumanRights Globally! 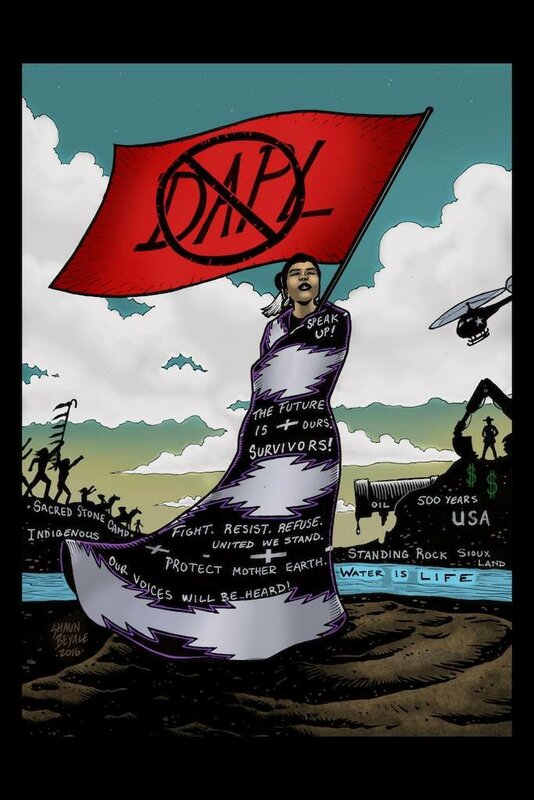 Your message of “Solidarity to Water Protectors at #StandingRock” echos to #Detroit, #Flint and the #Resistance. It is a message of #BloodOaths and #Unity! A Celebration of Tactics & Reconciliations to Empower a transcendence beyond the suffering of the 70’s resistance and upon #Divinity achieve your #Dreams, our dreams and #Destiny! Obama, this should have been done a long time ago. Free Leonard Peltier while you still can..
Leonard, your path to freedom has always been and always will be through the parole system; the path you have chosen has only led to your continued incarceration. To qualify for parole, you must acknowledge your crimes, show genuine remorse, and ask forgiveness from your victims’ families. You must also cooperate in the on-going murder investigation of Anna Mae Pictou Aquash. You say you were her friend; you know who was involved. It’s time to be a man. Honor the truth and it will set you free. Sadly, Obama showed no courage or compassion in this case and denied hope. Just one more broken promise, but Leonard’s successors are boldly standing up today from Standing Rock to Sells AZ, and fighting for Indigenous Rights around the globe. Words of a loving man to his People! Our ears are taxed by untruths of the government of this land. They’ve not followed nor abided by their own rules and laws. They are not useful nor beneficial. Our LeonardPeltier is a Great Man, I Pray for He, You n I to walk victorious for the future of OUR CHILDREN’S CHILDREN! We stand UNITED! Peace to ALL! Powerful words my brother Leonard! I keep you in my prayers and smudge everyday!